NASA is turning control of the Hubble Space Telescope overto the general public to give non-scientists a chance to choose which targetthe iconic observatory should turn its camera eyes on next. The U.S. space agency is inviting the public to vote for oneof six candidate astronomical objects for Hubble to observe in honor of the InternationalYear of Astronomy, which began this month. The options, which Hubble hasnot previously photographed, range from far-flung galaxies to dying stars.Votes can be cast until March 1. 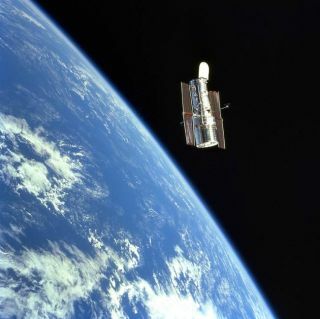 Hubble's camera will takea high-resolution image revealing new details about the object thatreceives the most votes. The image will be released during the InternationalYear of Astronomy's "100 Hours of Astronomy" from April 2 to 5. Everyone who votes also will be entered into a randomdrawing to receive one of 100 copies of the Hubble photograph made of thewinning celestial body. NASA is also inviting teachers and students to participate ina related Hubble Space Telescope classroom collage activity that integratesart, science and language arts. Students in participating classes can selecttheir favorite Hubble images and assemble them in a collage. Students in eachclass will also choose their favorite object from the image voting contest andwrite essays about why they made their selections. Launched in April 1990, the Hubble Space Telescope has spent18 years peering into the depths of the cosmos to return stunning images andhelp scientists better understand the history of the universe. NASA haslaunched four shuttle missions to fix and upgrade Hubble. The fifth and finaloverhaul by astronauts is dueto launch on May 12 aboard the shuttle Atlantis. Commanded by veteran spaceflyer Scott Altman,Atlantis' STS-125Hubble servicing crew plans to fly an 11-day mission and stage fivespacewalks to add new instruments, batteries, gyroscopes and other gear toextend the space telescope?s mission through at least 2013.